This is a beautiful rug and the starburst design is very pretty. The rug color is true to the pictures. I have received many compliments on this rug. Open up new decorating potential in your living room. The natural colors and materials come together in an oversized starburst pattern, and the large round shape provides coverage in a nontraditional way. This rug is made of good quality and fits nicely under my kitchen table. The natural color blends with almost any kitchen and this rug is actually a lot softer than I imagined. This rug is perfect! Put it under an antique round dining room table and the contrast is beautiful!!! Very durable! I clean it with a wicker broom or electric broom !!!! I get many compliments on it!!!! This was the perfect piece for under our round dining table. We love it! It wears well and doesn't show pet wear and tear. "You say this is brown. It looks like tan which is what I want. I am afraid it will be too dark." I would describe this rug as a slightly darker tan. But not dark enough to be brown. "Does this rug come in a rectangle shape?" 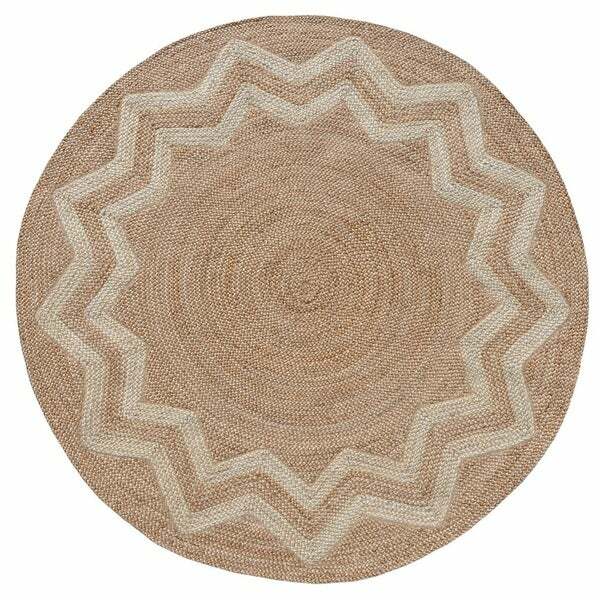 This jute rug does not come in a rectangular shape. "the details state this is an 8 ft round... but the header says 6ft. There's another 6ft (same rug) round that is a lower price. Is the header saying 6ft just a copy and paste error as this is a new item and perhaps when posting it someone made a mistake? if it is a 6ft round why is it more expensive than your other 6ft round that is exactly the same? thanks"
This rug is 8 X 8. We apologize for the confusion we might have caused.